The flat design juggernaut continues to roll on, crushing everything in its path. With an emphasis on simplicity, it’s easy to manage basic design principles when you’re working flat. We have got this beautiful Flat Rounded Square UI Kit. that you can download for free. 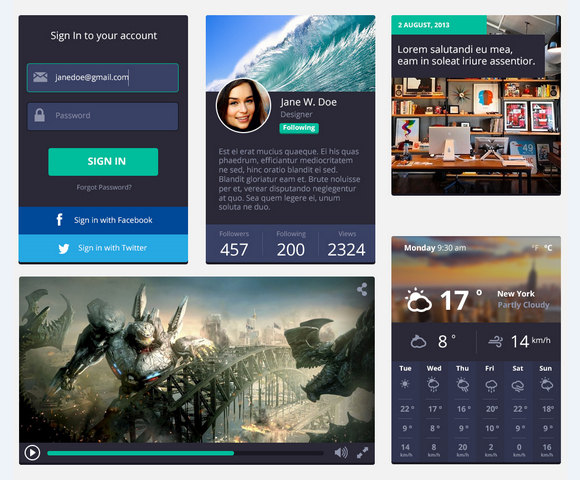 So, you can design visually interactive and appealing user interfaces with this awesome free kits. This UI kit is designed by Freepik, available in PSD format for easy modification. They can be used to design and mock-up web, app and software user interfaces. There are 20 original icons come with the UI kit as well. At the risk of looking a gift horse in the mouth… when are people going to start offering design kits as CSS instead of PSD? Its so pretty, thank you! !